I love pieces that help bring so much color to an outfit. I've had this skirt for 4 or 5 years now and I barely wear it. One - I'm not big on mixing colors and two - I hate over wearing such a beautiful piece of clothing. This skirt is a great summer piece, it reminds me of blue skies, sunny days and going for a walk in the River Valley. It's such a happy piece of clothing. P.S Does anyone else think sunglasses either make people look older or younger?! I think I look older when I wear sunglasses! Love this blue and yellow combo! Also love your hair! Cassie you are super beautiful, I like so much your skirt! Love your outfit and the colours. Now following you and I have a giveaway going on, I would love for you to stop by and enter!!! Thanks Annpaige! I'll be sure to check it out! Great pics and you are so pretty! I've started following you on GFC now! and ty! Loveee the blue and the floral! Great outfit!!! Come visit my blog! 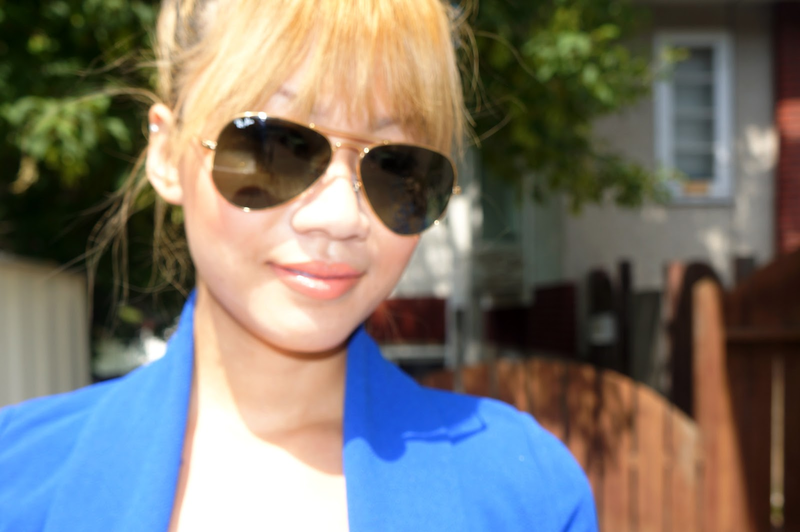 New post today..
You look besutiful on that blue!! !